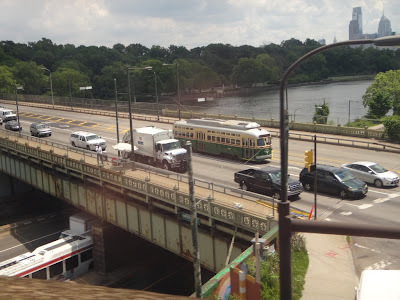 Photograph 1 - Passing through Philadelphia from the Amtrak carriage. 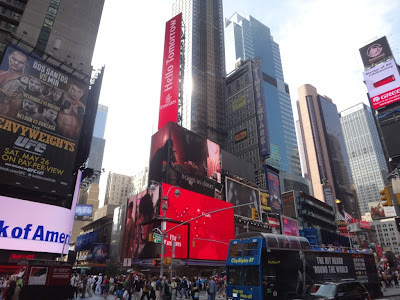 Photograph 2 - Times Square, New York City. 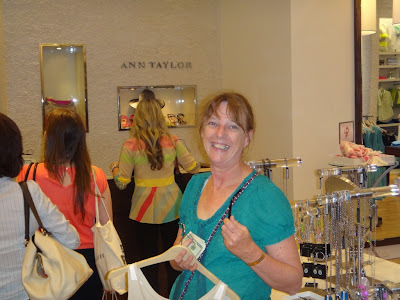 Phtograph 3 - Anne buying up big in Ann Taylor Fashion shop, along 5th Avenue, New York City. Photogragh 4 - 34th West Street, New York City - the Empire State Building in the bsckground.---------------------------------------------------------------------------------------------------------------------------------------------------------------------------------------------------------------------------------------------------------------------------------------------------Who would believe that we would ever visit the Big Apple? We departed our Washington DC B&B at 10am and was sorry to leave. Keith and Lydia Byrd and their maid Glenda were excellent hosts and they were first class in looking after us. I highly recommend anybody who would ever visit Washington DC to stay there. The location is in proximity to most tourist sites, near the metro rail, near excellent restaurants and the hospitality the hosts gave us was second to none. Our Amtrak rail journey to NYC took just over 3 hours. Their rail system is nowhere near the class as European rail but only slightly better than Oz standards. The conductor for our carriage was named Leroy and wore the uniform just like you see in those old American movies. The journey was fast and comfortable. Apparently the locals travel by bus as it is half the cost compared by rail. On the good side we had WiFi on board. We arrived at 34th Street Penn Street station on time at 2:20pm and once outside....wow...Sydney people should not complain about a crowded city. Everybody is on a mission and the number of people on the sidewalks!!!! Now about our accommodation we arrived at Abingdon Guest House and our "Robert" was waiting for us. He apologised for the mix up and admitted we were not the only people who had trouble. Robert appeared to have a speach impediment but intelligent enough to arrange a compromise with us. He gave us another room (The Windsor Room) for three days with a 10% discount. It worked out well - we have a superior room and for less than $200AUD per night is good value for NYC. A two-star hotel usually charge $320USD at a minimum. After checking-in we explored the wonders of NYC. 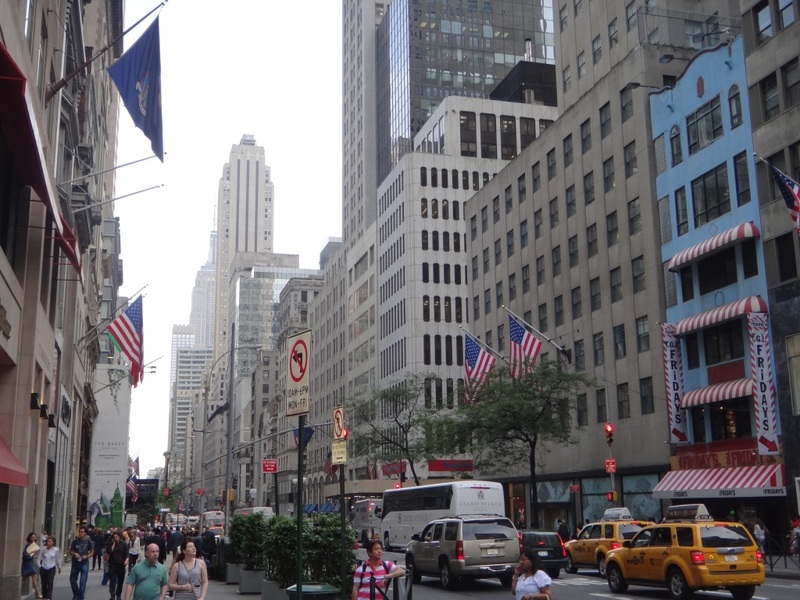 Caught the subway to Times Square and walked along 5th Avenue. Anne was amazed at the expense of Saks Store - a Stella McCartney jacket was a bargain for just under $3000USD. Not to be intimidated by this slight set back with the lack of cash flow she bought a $25USD top at Ann Taylor along 5th Avenue. Anne's big shopping spree in NYC was satisfied. We had dinner in an old style diner like the Seinfeld's Monks Cafe and called it a day. Tomorrow is our helicopter ride - we hope the skies will be clear as NYC is extremely smoggy. Cheers for now.